I spent last weekend painting the baby's room. We chose to paint it the same blue as our bedroom. I know, not very traditional for a girl, but she'll get her fair share of pink and I think we might try to do something more decorative later. Once it's done I'll put some pictures up. I guess I'll put some up of our room and the bathroom I painted recently, too. I got my hair cut yesterday, which is so good. I've been just letting it grow forever because I didn't know what to do with it, but it was driving me crazy and it never looked good, so I headed to the mall and got it chopped. I like it. Cooler, simpler and it looks better, too. 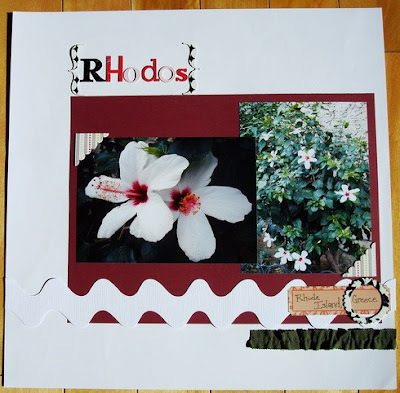 Since we've been so busy, I haven't done much scrapbooking. I did win one of the challenges at the Just Cre8 crop a few weeks ago, so I'm looking forward to getting my prize in the mail. I won something last year too and I got a great prize. I love good mail. You guessed it. Europe. This was on Rhodes Island, in Greece. Simple, but still nice. This weekend, I'm heading out for a girl's weekend. Yippee!!!! Should be fun. A little shopping, eating out, exploring and catching up. I've been looking forward to this. Have fun on your trip! If you do any baby shopping, try Carter's or OshKosh (may or may not have) but Carter's has some AMAZING deals on baby clothes! !